﻿ The Ann Arbor Chronicle | AAPS: Which Bus Route to Take? AAPS: Which Bus Route to Take? Ann Arbor Public Schools Board of Education meeting (June 4, 2010): At an extra, regular meeting on Friday evening, the school board heard an updated presentation on the details of a proposed consolidation of school transportation services with the Washtenaw Intermediate School District (WISD). The board’s second briefing on the consolidation and its vote, will come Wednesday, June 9. Brian Marcel, assistant superintendent of business services for WISD, walked board members through the proposal, and went through an extensive list of questions and answers about the plan. A few bus drivers from AAPS, as well as some from Lincoln Consolidated Schools, attended the meeting – one of them, Richard Miller, spoke during public commentary. The only other business conducted at the meeting was to approve a set of minutes, and to schedule an executive session before the next regular meeting on Wednesday, June 9. At Friday’s meeting, Brian Marcel shared with the AAPS board the final report of the WISD transportation consolidation administrative design team. Marcel briefed the board on issues that had come up during a meeting held with local bargaining units representing bus drivers and monitors. He also reported to the board on the Ypsilanti school board meeting when the transportation consolidation proposal was discussed. Also present on Friday to answer questions were: Jim Regan, of Transportation Strategies, one of the consultants hired by the WISD to manage the consolidation effort; AAPS director of transportation, Brad Mellor; AAPS superintendent, Todd Roberts; AAPS deputy superintendent for operations, Robert Allen; and AAPS assistant director of compensation/benefits administration, Shonta Langford-Green. The major elements of the plan that were presented and discussed on Friday included: wages and benefits; working conditions; organizational structure; oversight; district layoffs and WISD hiring; future restructuring of routes; bus ownership and use; and communication. Marcel began his presentation by showing a side-by-side comparison of wages and health insurance premium costs for transportation staff under four models: the current AAPS system, the proposed WISD plan, the rejected tentative agreement, or TA, (between AAPS and the transportation union), and privatization. The current AAPS wage range – for both general and special education drivers – is $12.82 to $17.47 per hour. Under AAPS, monitors (bus aides) earn from $9.66 to $13.49 per hour, and mechanics make from $15.65 to $20.87 per hour. AAPS transportation workers are covered under a Blue Cross Blue Shield PPO health insurance plan. The AAPS share of the health care premium is a function of how many hours each employee works per week – insurance costs for a family plan range from $423.03 to $846.07 per month. The wage range for general education drivers under the WISD plan is $13 to $16 per hour, with $.50 per hour more paid to drivers on special education routes. In addition, a premium of $.25 per year of service (YOS) in a local district will be added to the hourly wage. Bus monitors under WISD would make from $10-$13 per hour, and mechanics would make a flat rate of $21 per hour. WISD transportation employees would be offered a Priority Health HMO, with a family plan costing from $167.80 to $335.60 per month. If employees received coverage through a spouse, they could choose to opt-out of health insurance and receive additional payment. Neither the rejected TA nor the privatization numbers were discussed in detail at the meeting. Trustee Susan Baskett did note that wages would be higher under privatization. Allen pointed out that although wages would be higher, employees would have no pension. Marcel noted that, in addition, co-pays are higher under the Aetna plan offered under privatization. Trustee Andy Thomas asked how wage ranges were set, and Marcel answered that they were benchmarked against local and national public and private sector wages. Thomas asked how many drivers were currently at the top of the pay scale, saying “I’m just trying to get a feel for how many drivers’ salaries will decrease.” With input from Mellor, as well as some of the bus drivers in the room, Thomas determined that if current AAPS drivers’ average wage is $17 per hour, and their average YOS 7.5, the average loss in wages under the WISD system would be $1.50 to $2 per hour – over a 10% decrease. Board president Deb Mexicotte pointed out that some drivers would make more money than they do now, and trustee Simone Lightfoot reiterated Thomas’ question, “How many drivers are at the top of the pay scale versus the bottom?” Allen said he could bring the specific numbers to the board’s second briefing on the issue. Board secretary Glenn Nelson requested a grid with the row showing YOS, and the column showing the hourly rate. Board treasurer Christine Stead requested that the proposed wages also be included on the grid. Next, Marcel presented a list of recommended salaries drafted by the administration design team for central administration staff, ranging from $115,000 for the transportation director to $35,000 for the field trip coordinators. He noted, however, that though the recommended salaries are based on the benchmarking described above, some of them may need to be adjusted to fit within the existing WISD administrative structure. When questioned further by Baskett and board vice president Irene Patalan, Marcel gave two examples of proposed salaries that might need adjustment to fit into WISD norms. First, he explained, the director could not make $115,000 because the WISD does not have salaries that high; Marcel estimated a salary range of $100,000 to $110,000 to be more likely. Secondly, given the large number of employees managed by the supervisor/trainers, WISD would likely set their salaries about $10,000 higher than the design team recommended – closer to $60,000 instead of $49,150. Stead requested that a chart be created for the second briefing on Wednesday, which would compare, side by side, the design team’s salary recommendations and the salaries as they would be set by the WISD’s pay scale. WISD is proposing to grant each employee five sick days and one personal day, along with paid holidays to be determined by the time driver positions are posted. Baskett requested an additional chart be created for the second briefing, comparing sick days and paid holidays given employees under the AAPS and WISD structures. She also asked about the “attendance incentive” noted in Marcel’s report. Marcel explained that the WISD plan would pay cash bonuses to employees with few absences. Marcel noted that the WISD plan does not guarantee a certain number of hours of work per driver per day. AAPS currently has a minimum of four hours. In addition, AAPS pays drivers the same rate for down time between routes, while the WISD plan sets driving hours and waiting time at different rates. Lightfoot commented that it seems “inefficient” to not be able to schedule drivers in at least four-hour blocks. She asked if there were many two- or three-hour routes. Regan answered that the goal is to “operate buses at target capacity against the clock,” noting that the guidelines require students not to spend more than one or 1.5 hours on a bus. He said that it does not make sense to hire a driver below a certain number of hours per day, and judged that the “market reality” indicates about 5 hours as the minimum number of hours a driver should work – a 2.5-hour run in the morning and a 2.5-hour run in the afternoon. Jim Regan describes a part of the proposed transportation consolidation plan. Regan is with Transportation Strategies, one of the consultants hired by the WISD to manage the effort. 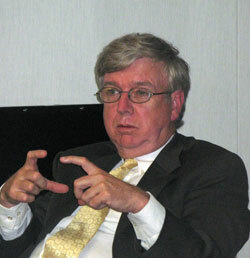 Mellor added that some people might be looking for part-time work, and might want a single, shorter run. He stressed that the current AAPS system would not allow a driver to work less than four hours per day, and that this new plan affords more staffing flexibility. Stead asked Roberts if AAPS had the option of altering school start times next year, and Roberts said no – next year, general education routes and times will be the same. Nelson confirmed that drivers under the WISD plan would not be private sector employees. Marcel confirmed that, no, they would be WISD employees, and still be part of the state public schools retirement system. He added that drivers could choose to unionize, but which union they’d choose would depend on which districts join the consolidation, since districts have contracts with different unions. Marcel described the organizational structure of the proposed plan, totaling 30-32 people for a 5-district consortium. The central administration team would include a director, assistant directors of three departments – operations, business services, and central dispatch – and their staffs. Marcel noted that the business services staff would be organized under WISD human resources, rather than with the other transportation services staff, which may realize some cost savings. He also pointed out that supervisor/trainers, though common to AAPS, are rare in other districts. The administration team, he said, believes that training is important to ensure the safety of children, and includes four supervisor/trainers in its operations department. Allen and Regan added that selecting the WISD option could create opportunities in the future to downsize AAPS central office staff, since the workload for each person in human resources would decrease if all transportation services were handled outside the district. Marcel explained that the WISD will use a different infrastructure/tracking system from the software currently used by AAPS – one that better integrates with WISD’s accounting system. Stead responded in defense of the software used by AAPS, saying that a lot of her clients used it as well. She noted that, while recognizing the transition as a “serious shift,” AAPS would be watching to be sure the infrastructure chosen by WISD accommodates drivers and manages drivers well. Stead later asked if the WISD had a survey tool that could be used to assess community satisfaction, and noted that AAPS will want “to monitor how things are going” with other metrics as well, including costs and length of time kids are on the buses. Nelson concurred, saying that hiring good drivers is the way to achieve satisfaction, and that even while under budget pressure, the board still wants to ensure an excellent educational experience all around. Baskett and Thomas asked about a timeline for laying off current district employees if AAPS decides to join the WISD effort, and if they would be eligible for unemployment. Thomas also asked whether employees who were laid off, but eventually hired by WISD, would need to COBRA their health insurance over the two months of summer. Langford-Green explained that 10-month employees are not eligible for unemployment over the summer, since they are generally assured of returning in the fall. This year, she said, it would be different, so workers could apply for unemployment. 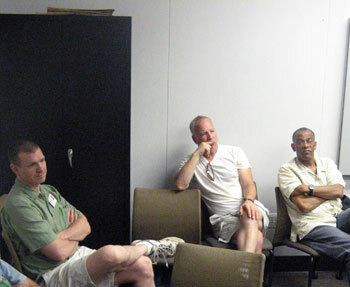 Marcel added that AAPS would not want to lay off all its drivers in June, since some would be needed over the summer. As for health insurance, Mexicotte suggested that the district could time the layoffs to bridge the two-month gap, but Langford-Green pointed out that that would not be necessary, since the district has already paid for health insurance for all transportation workers through August. Allen added that each participating district honors the pay out of retained sick/personal days differently, depending on the collective bargaining agreement in play. Nelson asked what the “drop dead” date was for districts to sign on to the WISD consolidation, and when drivers could apply for jobs. Marcel said that five of the administrative positions are already posted, with a closing date of June 8. But he acknowledged that “people are applying knowing it might not happen.” The driver positions would be posted once the administration team was in place, he said – likely by the end of June. Current employees of the consolidating districts will have priority in hiring before candidates are sought outside the county. Lightfoot asked if driver seniority would be a factor in hiring. Marcel answered that seniority would not be considered in hiring or routing, but reiterated the slight increase in wages it would mean, and asserted, “I have no reason not to want to hire your people.” Regan added that, though seniority per se is not taken into account in hiring, experience with specific schools could be. For example, he said, if a driver has run a specific route for a specific school, the intent would be to “keep the stability of the system” by hiring that driver for that route. Regan responded, “That’s not the intent,” to which Thomas replied, “Could you say, ‘That’s not going to happen.’” Marcel offered, “I’m not going to intentionally drive down cost at the expense of having more experienced people.” Mellor added that from a training standpoint, it would not be feasible not to hire experienced drivers. Baskett asked about drug testing and background checks to be done on drivers, and who would cover those costs. Mellor said that AAPS already does quarterly drug tests, and Marcel said the WISD system would pay for them (not the drivers). Marcel also explained that full background checks would only be done on drivers who had not previously worked for a participating district. Current drivers would be screened only with the Internet Criminal History Access Tool (ICHAT). Regarding future hiring, Lightfoot asked if the WISD would hire drivers only from the substitute pool, and whether the sub pool would be filled with drivers who were good enough to be hired, but for whom there were not enough positions. Marcel said the WISD would keep names of qualified drivers on file who were not chosen initially, and Regan noted that people who have had experience on the district’s routes and in the WISD system would be logical fits, if positions open up in the future. Lightfoot asked what happened if districts join the consortium late, and who would cover the new routes. Mellor said WISD would need to hire to fill out the routes, and add staff to the necessary capacity. There was some discussion of how it would work to have different districts set different standards. Baskett noted that if some districts modified the standards to decrease walk zones or ride times, the overall savings would be reduced for all participating districts. Allen agreed and noted that because of the interplay of factors described, routing decisions directly become budget decisions. Nelson stated his understanding was that if a district wanted to change routes in a way that increased costs, that the district would pay the difference. Marcel confirmed this as correct, calling that difference the “fully-burdened rate” that would be billed to each district. Lightfoot asked how such cost allocation would be ensured, and if language guaranteeing it would be included in the resolution. Thomas noted that decreasing future routes would cut miles, hours, and therefore drivers needed. Mellor responded that the district re-routes every summer, saying routes are close but not identical from year to year, and that increases in efficiency are usually covered by attrition from year to year rather than the need to lay off drivers. Nelson noted that special education routes are “being redesigned as we speak,” and that there may be cases in which some general education routes could change too if huge efficiencies would be possible. Regan explained that the Michigan Department of Education would prefer that the buses themselves remain the financial responsibility of each participating district. Therefore, the plan will be for each district to sell its bus fleet to WISD for $1 for use in servicing the routes of its own district. If a district decides to stop participating in the consortium, Regan said, the WISD would sell the same buses back for $1. He added that there is a line item in the WISD budget to track amortization, but that individual districts would pay for any future buses needed for their routes. Nelson asked how much of the 2004 bond fund was left for buses, and if it could be used for other improvements if AAPS enters into the WISD arrangement. Allen confirmed that there was $1 million slated for buses that could be used for other non-operating expenses, but Lightfoot questioned whether it would be wise to spend the money in case it doesn’t work out. Lightfoot also asked whether buses would be shared among district routes. In general, Mellor said, no – general education route buses are designated. However, during inspections, or in the case of an emergency, sharing between districts already happens, and that “flexibility” would continue under the WISD plan. In addition, special education buses would be purchased by the WISD and shared among all participating districts. Mellor answered that all calls would be logged first at central dispatch, and then student discipline issues would have to come back to the district. Roberts added that this is similar to what happens now in AAPS, saying that if a student gets left at a stop, the call comes to central administration, but if a kid comes off the bus and says someone hit him on the bus, that call goes directly to the building principal. Regan offered another pitch, “It’s not like someone is bringing in an outside system. Most of the sub processes, systems, and routines are already what you are doing.” The only time, Regan said, that WISD processes would be different from what AAPS is already doing would be if a better practice was found outside the system. In response to Lightfoot’s concern, Marcel also offered help from WISD, saying the WISD has a communications person who could help “craft” communication with the public. Baskett asked if there was a plan for communicating regardless of how the board moves forward, and noted the condensed timeline. Usually, she said, there would be more time between a first and second briefing. The second briefing of the transportation consolidation plan will come before the Board on Wednesday, June 9. After the second briefing, the board will vote. Amy Osinski, secretary to the board, said she would post the full report presented at this meeting on the board’s website. Bus drivers from AAPS and Lincoln Consolidated Schools attended the June 4 AAPS board meeting, held at the district's Balas administration building on South State Street. Richard Miller, a bus driver for AAPS, spoke out against the plan. Though he called his attempts likely “futile,” Miller argued against the consolidation, saying it has already taken a toll on the drivers’ morale. Citing the praise and thanks drivers have received over the years as “insincere,” Miller called the consolidation process “cold water thrown in the faces” of current drivers. On a consent agenda moved by Andy Thomas, and seconded by Glenn Nelson, the board unanimously approved passage of meeting minutes of the May 26 regular meeting. Stead then moved to schedule an executive session on Wednesday, June 9 at 5:30 p.m., for the purpose of negotiating and attorney-client privilege. The executive session scheduling was seconded by Thomas and was also passed unanimously. 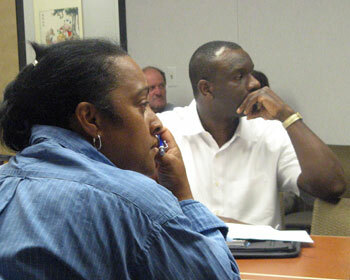 There were no items for agenda planning, items from the board, association or committee reports at the meeting. Present: President Deb Mexicotte (for the first half), vice president Irene Patalan, secretary Glenn Nelson, treasurer Christine Stead, and trustees Susan Baskett, Simone Lightfoot, and Andy Thomas. Also present as a non-voting member was Todd Roberts, superintendent of AAPS. Next regular meeting: June 9, 2010, 7 p.m., at the downtown Ann Arbor District Library, 4th floor board room, 343 S. Fifth Ave. I feel badly for the bus drivers, who stand to be thrown into a mess of uncertainty and lower compensation. In order for the consolidation to go forward, the WISD needs both Ann Arbor and Ypsilanti (whose school board is discussing this tonight) to sign on. I see this as an opportunity for the school boards to set conditions. for instance, they could both say that they will only go ahead with the project if the WISD agrees to a)hire by seniority, in accordance with the size of each of the districts (say, if 25% of the total student body is going to Ypsilanti schools then they will hire 25% Ypsilanti drivers) and b) as job openings come open, offer them first to those bus drivers who were laid off. That’s only one example, and there are likely others, that would be a way to show good will and true interest in the drivers. The way they are being treated is unconscionable. Had I thought of it, I would have! And I agree with you. The consultants working on this proposal are working directly for Sodrel Transportation, a private company that has already privitized several major school districts in the MidWest. Look it up. While the changes and improvements to operations and efficiencies have merit and should be implemented under a new Washtenaw County level organization, UNDER NO CIRCUMSTANCES should ANY part of that new organization be put under private control (ownership, cost savings sharing, no-bid contracts, etc). ALL SAVINGS and gains should be returned to the schools districts and students and CONTROL of consolidated operations must be maintained by the county school management who are responsible to you, the parents and citizens, NOT privitizers whose ONLY interest is short-term profit. Improve how things are done, but beware.